In the dream, I was in a large building that looked like a mall in the city of Guayaquil, Ecuador. This is the city that we usually fly into from the U.S. whenever we go to Ecuador on a mission trip. The City of Guayaquil is right by the Pacific Ocean and is only a few miles from the Pacific and at a very shallow elevation of 40 feet above sea level. People were busy bying in the stores not aware that something had taken place in the Pacific Ocean. The building was about three stories high and very beautiful. I could not tell what had happened, but I began to hear the same low, rumbling sound that I have heard before as it kept getting louder and more disturbing. This building that looked like a Mall had a part of its ceiling that was made of glass, so that when you looked at it you were able to see the skies and the sun. As I was looking outside through the glass ceiling, I began to see a huge Tsunami coming over the building. 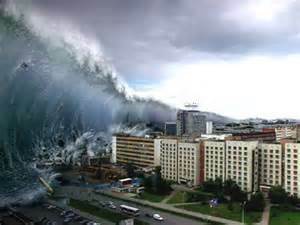 It was a very large Tsunami that went over the mall because the building was over 30 feet high. As the people saw the large Tsunami wave over the building, they began to scream and run. At that point, I woke up. This is a prophetic warning dream about an event that will take place in the Pacific Ocean that will affect the western coastlines of the North American, Central and South American Continents, as well as all the countries in the Ring of Fire. This event will trigger massive Tsunamis throughout all of the underlying areas located near the Pacific Ocean. This event will be triggered during the coming pass by of the celestial object that we have referred to before in other articles known as Planet X, Nibiru, Destroyer, Wormwood and other names. We are beginninig to see signs in our planet already that these things may come in the very near future. Millions of people will die during these cataclysmic events spoken of in the Bible. You must do all you can to repent of your sins and get right with the Almighty so that you will not be lost, but have everlasting life in Christ Jesus Yahushua. He is the only way to the Father. Shalom. Jeremiah 6:10: "To whom shall I speak and testify, that they may hear? behold, their ear is uncircumcised, and they can't listen: behold, the word of Yahweh is become to them a reproach; they have no delight in it." Ezekiel 33:2-5: “Son of man, speak to the children of your people, and tell them, When I bring the sword on a land, and the people of the land take a man from among them, and set him for their watchman; if, when he sees the sword come on the land, he blow the trumpet, and warn the people; then whoever hears the sound of the trumpet, and doesn't take warning, if the sword come, and take him away, his blood shall be on his own head. He heard the sound of the trumpet, and didn't take warning; his blood shall be on him; whereas if he had taken warning, he would have delivered his soul.